Make good use of those abundant holiday meal leftovers in your fridge and don't waste one delicious bite. 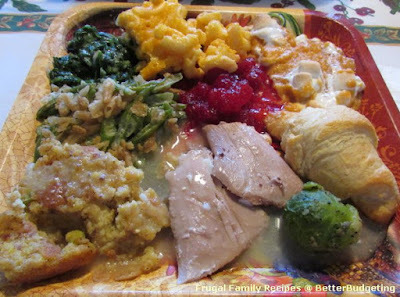 If you are unable to use up your leftovers now or at least prepare them for the freezer, give them to someone who can. Tossing leftover food in the trash should always be our very last option. For most of us, one small cup of this rich and creamy holiday beverage is usually enough. This can result in plenty of leftover eggnog just waiting to be made into a delicious treat. Did you know you can use eggnog in place of milk for your morning latte, French toast, and pancakes? Or, in the remote possibility that you did not have enough sweets for the holidays how about some eggnog bread pudding, cakes, cookies, pies, or even eggnog tiramisu? The tasty uses for leftover eggnog are practically endless. Whatever the main course was for your holiday meal, it's just about guaranteed that the leftovers can be used in many of your favorite recipes. Take a moment to figure how much you have left and how much you can use up in the next few days with salads, sandwiches, soups, and casseroles. Then freeze the remainder in recipe-size portions (one pound, half pound, etc. ), in airtight containers. Write the current date on the containers and use within 6 months. For leftover baked ham try our Quick Tortellini with Ham and Butter Sauce recipe and turn leftover turkey into Easy Barbecue Pulled Turkey Sandwiches. If turkey was your main dish, don't throw that valuable carcass away! Place the leftover cooked turkey bones in a large pot of salted water. Add herbs, veggies, whatever you have leftover (celery tops, onions, herbs, etc). Bring to a boil, then cover and simmer for 1 hour. Strain broth and discard bones and veggies. Store broth in fridge or freezer to use in your favorite soups and other recipes. If you will be cooking for one you can freeze the broth into ice cubes and then place them in a large airtight container. Slice up your favorite winter squash and roast in the oven for about half the cooking time. Add leftover cornbread or bread crumb dressing/stuffing to the scooped out center and return to oven for remainder of cook time. Remove from oven and cool for 5 minutes before eating. Delicious. If you have a large amount of stuffing leftover and would like to serve it later, freeze single-size portions in a muffin pan and then place in an airtight container. If you're lucky enough to have leftover homemade giblet or turkey gravy you can do what we do; freeze it for the next holiday to save time in the kitchen. Since fresh gravy can only be stored in the fridge for 4-5 days, we've been doing this for years and it works like a charm. If you'd rather use up the extra gravy now just pour it over some hot biscuits or hash brown potatoes for breakfast, morning or night. Leftover cranberries? Not a problem! First, be sure to grab a spoonful of chilled cranberry sauce from the fridge every time you heat up a plate of holiday leftovers. They add a pretty color and a tangy sweetness to an otherwise very savory meal. If you have enough leftover, freeze the remainder for the next holiday. 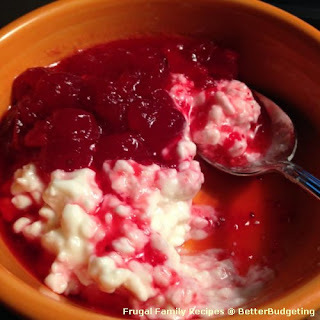 If you only have a small amount of cranberry sauce leftover, use a spoonful as a delicious fruit topping for yogurt or cottage cheese. Or, as an additional topping for bagels and cream cheese. You might also enjoy our Ham Biscuits with Cranberry Sauce. This one is so simple it can be easy to forget. Store any veggies you might have leftover in an airtight container (in the fridge for up to a week or in the freezer for up to 6 months), to use in just about any recipe you can imagine that calls for a variety of vegetables, or "whatever veggies you have on hand". Leftover veggies like carrots, corn, greens, potatoes, squash, and spinach, are great for soups, stews, casseroles, and even veggie smoothies. No need to ever waste these leftovers. Leftover mashed potatoes are perfect for Shepherd's Pie. Don't have a recipe? Not to worry. We have 21 recipes for Shepherd's Pie! Or, you could turn them into our quick and easy Twice Baked Mashed Potatoes. Many desserts, especially those that are bread (flour) or fruit based will keep wonderfully in the freezer. Whenever we have leftover cakes, cookies, or pies, I divide them into individual servings and freeze separately in plastic zip bags. Leftover breads can be made into quick and easy cinnamon rolls or biscuits for breakfast, simply add butter and cinnamon sugar and toast under the broiler for just a few minutes. Or, you can always make turkey sandwiches with mayo, the traditional favorite. Afterall, what would a holiday be without leftover turkey sandwiches? I also like to add a spoonful of cranberry sauce to mine. Delicious! However you chose to use up your holiday leftovers, and other leftover foods from week to week during the rest of the year, the most important thing is that you do. "To keep turkey from drying out store it with the gravy on top. The added liquid will keep the turkey moist." - W.H. Share a Tip: Do you have a good way to make the most of holiday leftovers? Please contact us, we'd love to hear from you!